This aluminium coffee maker, found in Italian households for more than 100 years, does not only offer the charms of traditional design. It also conjures up a perfect result, enjoyed by coffee and espresso lovers the world over. It is easy to use: simply fill the bottom section with water, fill the filter insert with coffee grounds and set the coffee maker on the stove. (Not suitable for induction) After 4-5 minutes, the coffee will be in the compartment all ready for pouring. Then all you have to do is enjoy it! 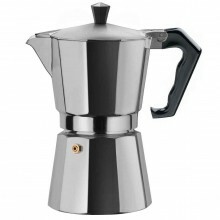 Click the button below to add the Brazil express 6 cup espresso Coffee Maker Aluminium made in Italy to your wish list.